Homeowners, retailers, big-box stores, educational and medical facilities are choosing polished concrete for their floor finish because of the competitive advantage a concrete floor offers over other types of floor coverings. Decorative concrete in the form of polished floors has become the logical choice because of the great value it delivers, and because it can compete aesthetically as well. Cost savings: Compared to conventional floor coverings there are no added costs for prep and install. Longer life-cycle savings: Polished floors are extremely durable and do not need to be replaced. Easy to clean: Unlike tiles and carpet there are no grout joints or fibres to attract dust and allergens. Cost savings: Using the existing slab as the finished floor is more cost effective and maintenance costs are lower. Maintenance is easier since all areas are one continuous surface. High resistance to foot traffic: Concrete floors are a very hard wear surface and can stand up to the everyday wear and tear of retail or even industrial work spaces. Less maintenance and longer service life: Polished floors are easy to clean, requiring only occasional damp mopping or floor maintainers with a neutral based cleaner. They eliminate the need for messy waxes or coatings as well as the expenses involved in applying them. Mechanically polished concrete resists the marks of forklift truck tires and staining from oil and chemical spills. 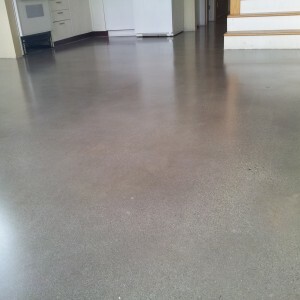 Resistant to moisture transmission issues: Polished concrete allows the floor to breathe and eliminates issues that arise with other flooring materials that seal off the concrete, such as Paint, Vinyl tile etc.